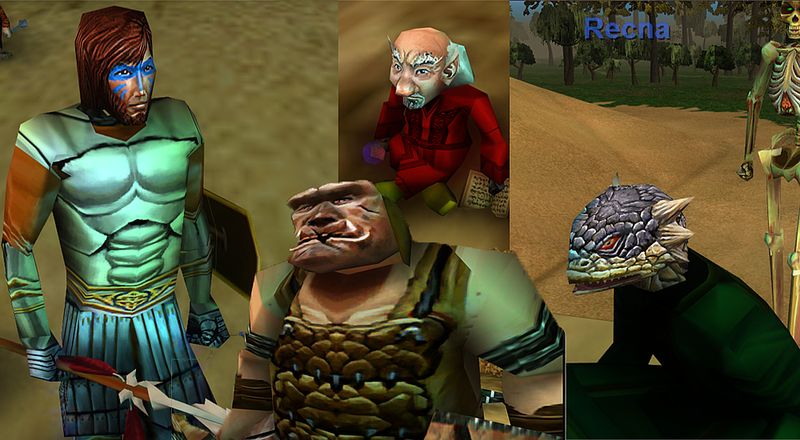 Project 1999 - 2 EQ character texture projects Completed, Download them here!! 2 EQ character texture projects Completed, Download them here!! I've re-textured the character files in two different style and methods. **I've used the textures from this post in both of my projects. Special thanks to Nysus and Xevin. In my most recent project, I wanted to simply make the classic images appear untouched but just in higher resolution. Obviously normal scaling techniques would leave the texture looking just as blurring as it was before i re-sized it. However, after a bit of research I found a program called Perfect Rezise 7.5 . I utilized this technology to increase all the textures by 400%. The result is subtle, but In comparison you will surely notice a difference. Here is an album i made to show some of the comparisons, but I would urge you to download the textures and try them yourself. I personally like this pack a lot. For more information on this pack and some screenshots Click here. I used a program called Vector Magic to process the images. Also I made a little video running around a fully (well almost) Retextured EC zone including all the mobs guards ect. Watch here. Unfortunately It is entirely too time consuming to re-texture every zone, So I will not be doing that. I may however do some more global files at some point. To Install open the zip file you downloaded and extract the folder to your EverQuest folder. It will ask you if you want to rewrite the files, Do so. This is a project i've been working at for a bit on and off, so i decided to throw it on here instead of making a whole post about it. This program forces newer Direct X effects into EQ. The developer of this program method was first used to make old GTA games look newer, but it can be applied to any game as long as the settings are tweaked accordingly. I have two downloads here, The first one is for higher end PCs and the second will run on just about any PC but it still looks great. 2) Extract the 4 files into your EQ directory. 1) You will know everything worked if when you open P1999 green text will temporarily appear on the right every time you open EQ. 3) if you're feeling like you want to turn down the bloom or mess with the settings, you can open enbseries.ini with notepad and mess with the values, thats all I did. you have to close out EQ and restart it everytime you edit the INI, can be time consuming to tweak as you want. 1) just remove the 4 files from your directory. **Note: backing up the file(s) you replace is extremely important, I will not be posting revert versions of these files, Also I will not be posting any screenshots of these files at this time, Just try them out! it takes maybe one minute to backup your file(s) and unzip my file(s) into your EQ directory (don't forget to rewrite!). Giving feedback on these experimental files i'm doing will encourage me to do more if interest is there. sure do, they're linked in the original post. More of this, these are awesome I was thinking why nobody had ever done this months ago. Gonna keep an eye on this thread for any updates. Does this include weapon textures btw? Will these textures work with other EQ EMUs on the server lists? How long does it take to redo a whole zone? Make sure you turn on 'Shadows' if you put on the cell shaded textures. goes really freakin well together.